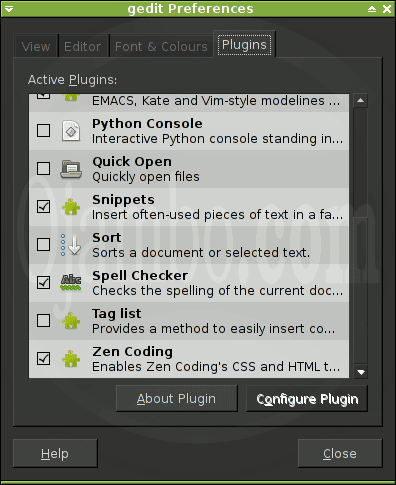 Zen Coding is a plugin for structured code such as HTML, and XML. Zen Coding works by expanding CSS-like selectors. Zen Coding has an abbreviation engine allows abbreviations into different languages. At the time this article was posted, Zen Coding supported CSS, HTML, XML/XSL and HAML languages via filters. Supported editor or unofficial implementation. Zen Editor interface for Do-It-Yourself. Zen Coding Controller for Do-It-Yourself. Gedit was discussed when Ojambo.com reviewed cross-platform lightweight programming editors. Gedit is written in C and Python, therefore, it supports the Python Zen Coding API. 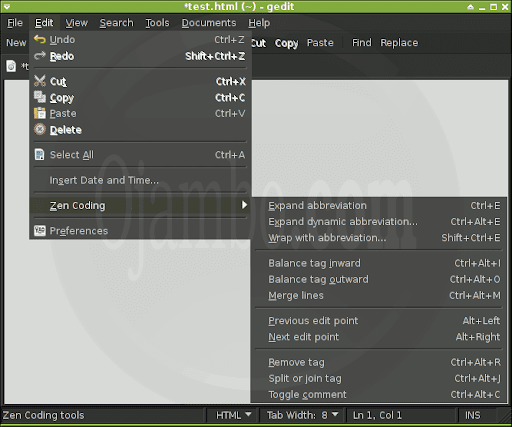 Gedit has third-party Zen Coding plugins by Franck Marcia and Mike Crittenden. The plugin was downloaded as a zip file and decompressed. The zencoding.gedit-plugin file and zencoding folder were moved to the local gedit plugins folder. Gedit was executed. Opened the edit menu and opened Preferences. Selected the Plugins tab and activated the Zen Coding Plugin. According to Mike Crittenden, shortcuts can be changing in the “plugin.py” file which is located in the zencoding folder. Saved as new file as “test.html”. Zen Coding expanded the css-like abbreviation “div#page>div.logo+ul#navigation>li*5>a”. The outer div was given the id of page. The inner div was given the class of logo. The unordered list was given the id of navigation and all list items contained a link with the “href” attribute. Check the Zen Coding website to determine if your editor is supported. Create your own plugin for your favourite unsupported editor. Send a note of thanks to the Zen Coding developers. This entry was posted on Wednesday, August 3rd, 2011 at 12:00 am	and is filed under Tips & Tricks. You can follow any responses to this entry through the RSS 2.0 feed. You can leave a response, or trackback from your own site.